Alan B. Ruprecht became severely disabled by adult polio . After being hospitalized for two years and spending six months in an iron lung, he realized the limitations that an inability to drive would impose on his life. Ruprecht tried many of the available hand controls of the era and found them to be expensive, cumbersome, and poorly made. He applied his background in engineering and metalworking to develop a hand control that was easy to install, fit any automobile, was interchangeable, and could be mass-produced. Before Ruprecht’s hand control, most controls were custom made to fit one particular automobile. 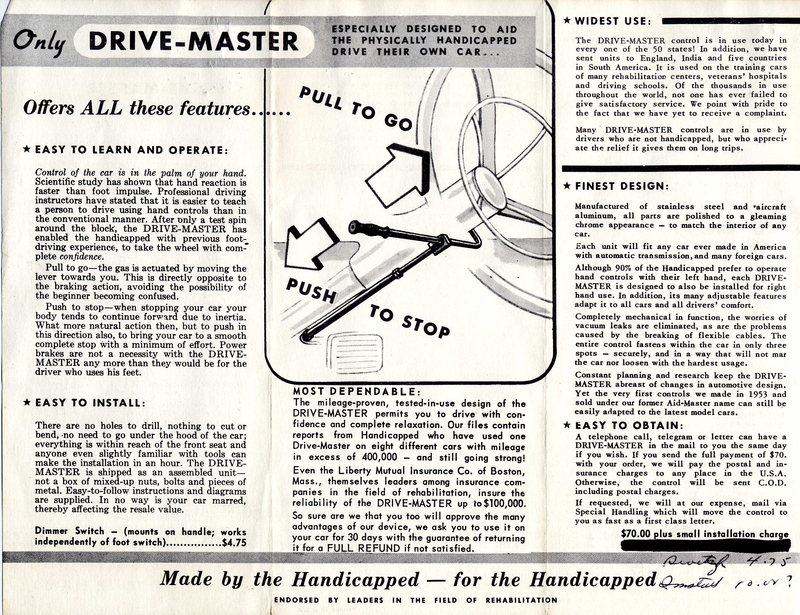 In 1952, Ruprecht founded Drive-Master, and his invention became known as the Drive-Master Push Pull Hand Control System. Drive-Master developed its product line by meeting the needs of individual clients and adapting to changes in automotive technology. After hand controls, the company began manufacturing left-foot gas pedals for those who needed to drive using only the left foot. To accommodate drivers whose legs could not reach conventional pedals, the company developed pedal extensions. Drive-Master's next innovation involved the refinement of rotary wheelchair lifts. Helper Industries designed a rotary wheelchair lift that extended 36 inches as opposed to the typical 48 inches. This shorter span made exiting and entering a van easier because the lift was usable in tighter parking spaces. Drive-Master refined this lift by making a rear post rotary lift driven by a super winch and cable system. The final refinement did away with the super winch and used a lead screw. Drive-Master's wheelchair lifts enabled the company to begin modifying vans to accommodate drivers in wheelchairs. In the 1970s, automobile manufacturers modified the design of full-size vans. Previously the engine was positioned inside the van’s passenger compartment. This design did not allow driving from a wheelchair. In the 1970s, the engine was moved to the front of the automobile, which could accommodate a wheelchair driver if the roof were raised or the floor lowered. Drive-Master developed a floor modification consisting of troughs that would allow a manual wheelchair user to roll into the troughs and be positioned at proper height to drive. Drive-Master's trough floor accommodated manual wheelchairs but not power chairs because the batteries were located underneath the chair. This led to the Drive-Master Power Pan. This system allowed a power chair user to roll in behind the wheel and push a button that lowered a section of the floor into the proper driving position. Alan Ruprecht's son Bart developed two of the company's major innovations. He devised a foot steering system that connected a remote steering wheel in the floorboard with a chain to a gear on the original steering column. This direct drive design provided a less expensive foot steering alternative to the more costly electronic foot steering systems. Bart also developed a technique to modify steering to greatly reduce the effort. Through a series of measurements, calculations, and lots of tinkering, Bart figured out that by reducing the diameter of the torsion bar in the power steering gear box, the effort involved to steer could be reduced to accommodate a particular driver’s needs. 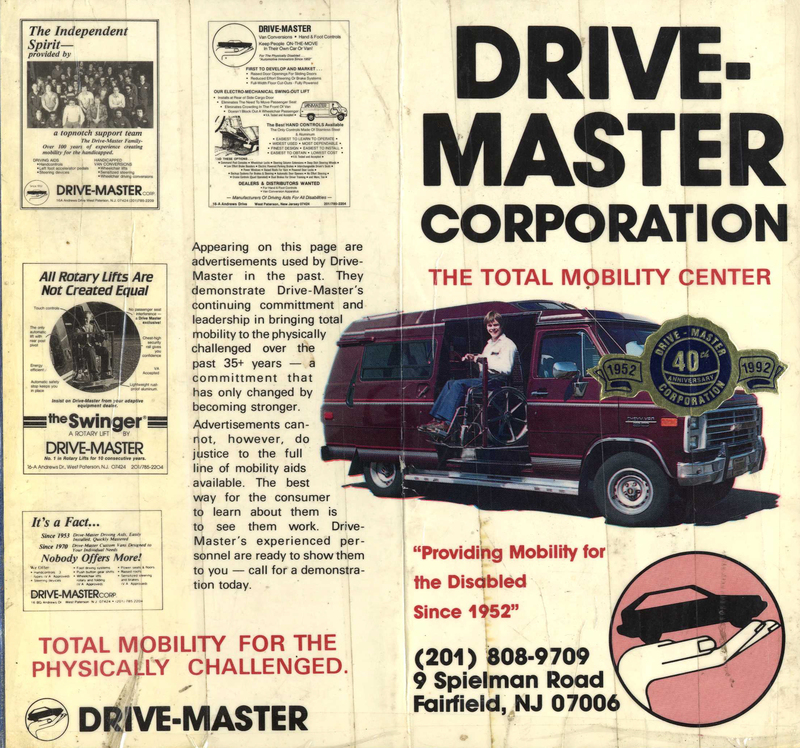 Today Drive-Master is the oldest family owned and operated mobility equipment dealer in the United States. Peter Ruprecht is the president and runs the company along with his wife and children. The company designs and manufactures all of its mobility equipment. Most of their product line is mechanical rather than electronic because they are committed to keeping a relatively low cost for customers. 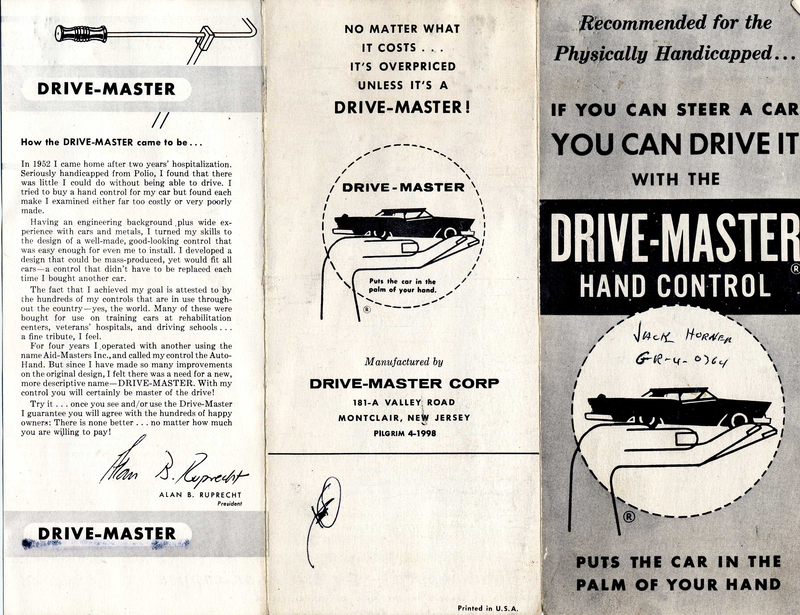 The Drive-Master Hand Control System has been somewhat refined over the decades, but it has changed very little from Alan’s original design. Ralph Braun posed on one of his early scooter designs. Ralph W. Braun was born on December 18, 1940 in Winamac, Indiana and passed away on February 8, 2013 in his birthplace after a lifetime as a pioneer in the mobility equipment industry. As a child Ralph was misdiagnosed with muscular dystrophy, and physicians told his parents that his life would best be lived in an institution where the progression of his condition could be studied. They were wrong about two things. Braun actually had spinal muscular atrophy, and his life was best served out in the world. His parents always supported him in any endeavor and taught him to rise above his physical limitations and overcome life’s obstacles. Experiences in Braun’s early life inspired him to become an inventor out of necessity. By the age of 15, Braun could no longer walk and required a wheelchair. Difficulties with school accessibility caused gaps in attendance, and he cultivated his mechanical knowledge with publications such as Popular Mechanics and Scientific American. He often tinkered with spare parts in his uncle’s shop. After graduating from high school, Braun attended Indiana State University for a year and experienced great difficulties navigating the campus in his wheelchair. 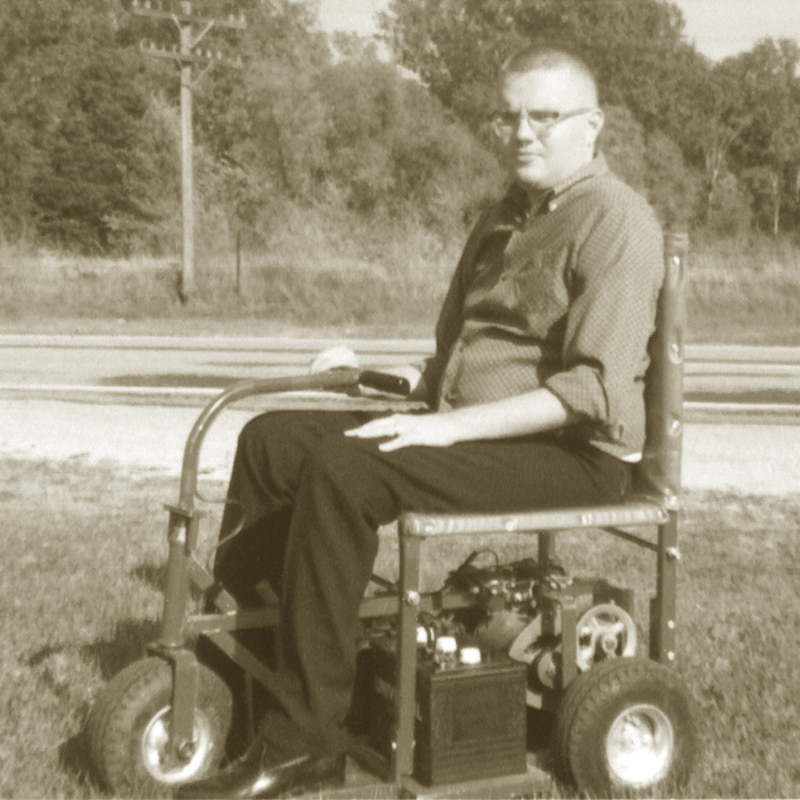 After dropping out, he resolved to invent his first motorized wheelchair. 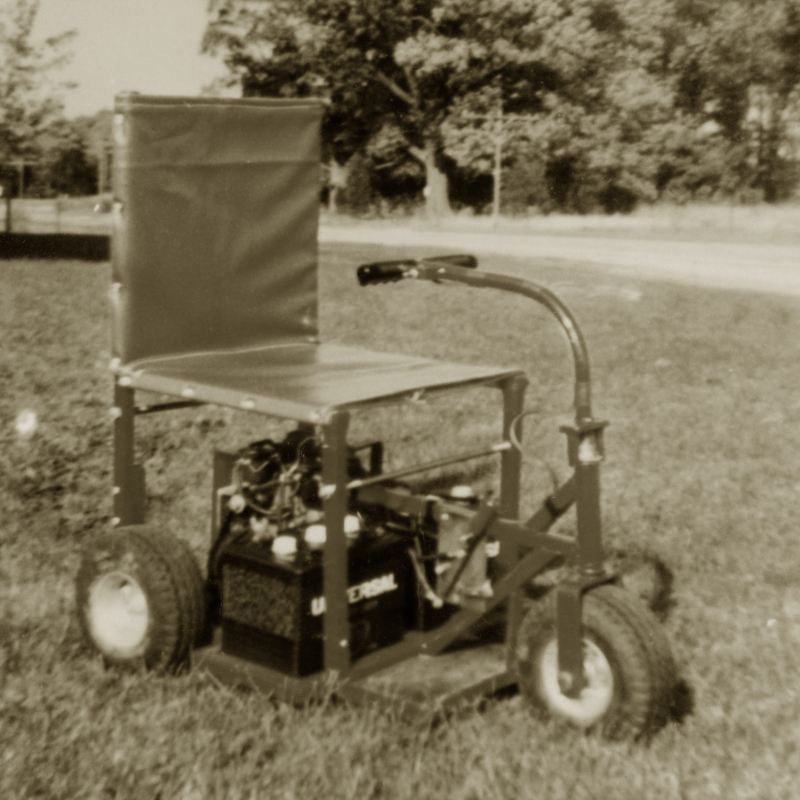 In the summer of 1963, Braun’s tinkering brought forth his first motorized wheelchair. Starting with the frame from a Crosley CC, a small four-cylinder car, he chopped the front end down to 24 inches and added the electric motor from a Pontiac kid’s car, two six-volt batteries, a lawn mower differential, four wheelbarrow tires, and a kitchen chair. 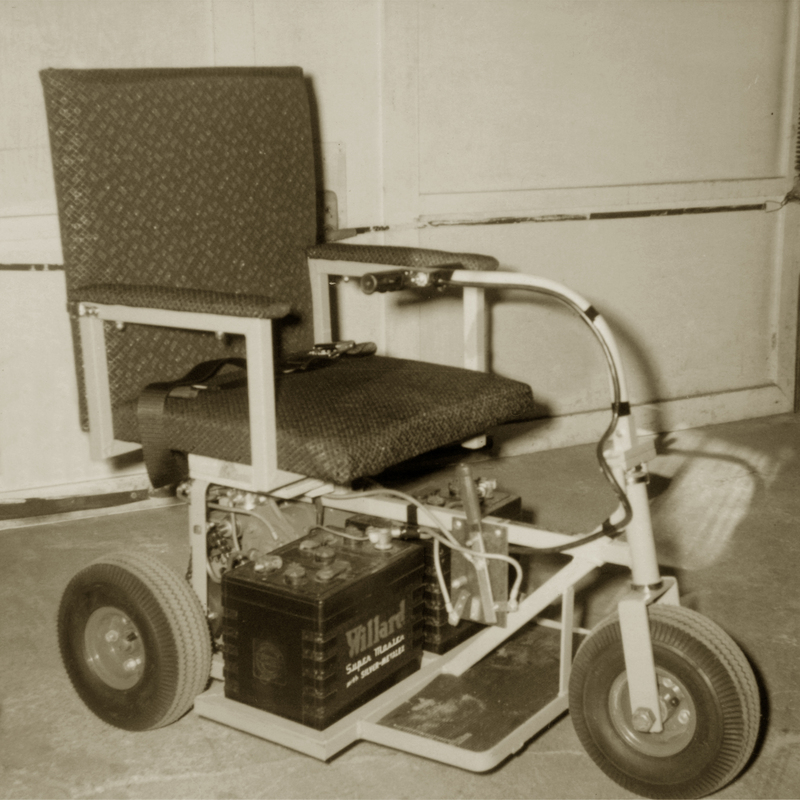 Adding a hodgepodge of unrelated parts and jury-rigged wiring, Braun finished his wheelchair in his father’s garage and test drove it through his mother’s kitchen. It was loud, smelly, had two speeds of seven and a half miles per hour or 15 miles per hour, lacked a reverse gear, had no brakes, and tore up everything in its path including the kitchen floor. The experience taught Braun that he could create something out of nothing, and soon he invented his first three-wheeled mobility scooter. 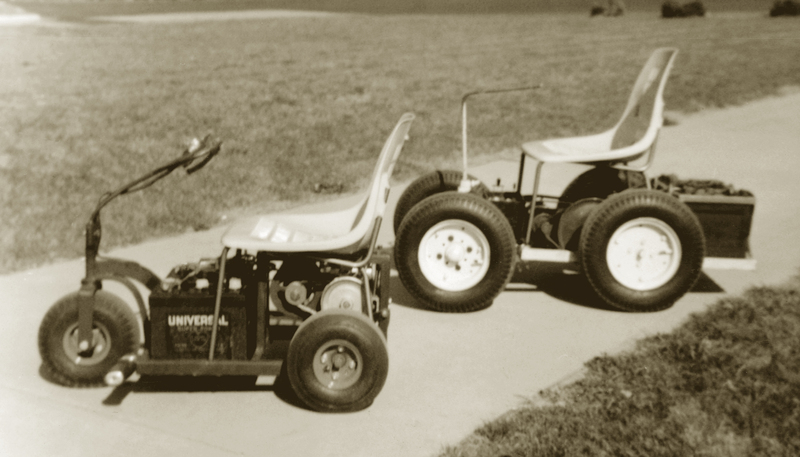 Ralph Braun's first two motorized chairs, the first four-wheel iteration and a second tri-wheel version. Braun now knew that he wanted a smaller, three-wheeled scooter with better steering, brakes, variable speed, and reverse. Variable speed was a major challenge. Braun found an ad for a one-person golf cart that would suit his needs, but it was too expensive, so he contacted the motor manufacturer Gillette and traveled to White Pigeon, Michigan to buy a motor. The company’s owner, Paul Gillette, taught him how to make an electric motor reversible with variable speeds. Gillette showed Braun how he took an old Ford generator, rewound its fields, and added more connections, making it reversible. Then Gillette showed him how to wind varying lengths of wire into coils over solenoids to make variable speeds. 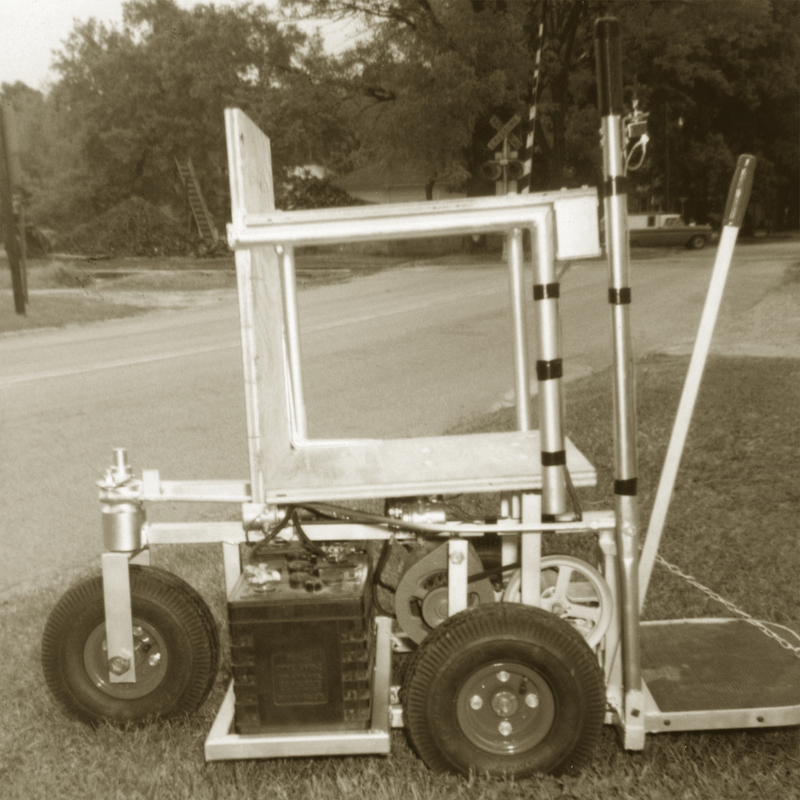 Braun bought a motor and endeavored to build his second powered wheelchair. These are three iterations of Ralph Braun's scooters as each prototype refined the design. Now that he had variable speeds and reverse, Braun’s next improvement concerned handling and steering. He used another lawnmower differential and fabricated axles that were the proper size. He obtained go-kart tires, aluminum tubing, and motorcycle foot pegs for his legs and welded it all together to make his first mobility scooter, which he named the Tri-Wheeler. Braun used his Tri-Wheeler for mobility around his home and neighborhood, and as transportation to work. It was a common sight to see him driving across Winamac to his job as a quality controller. In 1963, Braun began building Tri-Wheelers for others and founded his first business, the Save-A-Step Manufacturing Company. When his employer moved to a larger site on the other side of town, the need arose for a more substantial vehicle that would provide some protection from the elements. 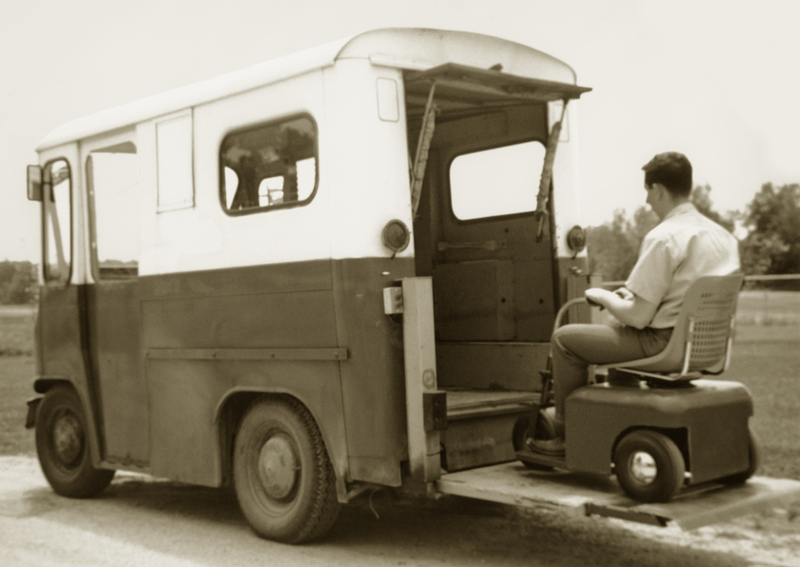 Wheelchair accessible automobiles that allowed driving from a wheelchair or scooter were virtually unheard off in the 1960s, so Braun set out to create one of the first. He purchased a surplus Jeep FJ-3 Fleetvan mail truck, a small, maneuverable cargo carrier built between 1961 and 1965. The FJ-3 sometimes is referred to as the forgotten Jeep. It is essentially an early minivan and resembles today’s Federal Express trucks. The van was an empty shell with room enough to accommodate driving from his Tri-Wheeler if he removed the seat and installed hand controls for gas and brakes. Braun's prototype lift on his postal Jeep accomodated his early retail Tri-Wheeler. Braun’s major challenge was to devise a way to get into the van with his scooter. He thought about using a ramp but ultimately decided to devise some sort of lift to raise him the 30 inches needed to roll into the Jeep. He eventually found a company that made hydraulic tailgate lifts for pickup trucks, so he purchased one and took it back to his parents’ garage. His first lift-enabled wheelchair van came together relatively quickly. After attaching the lift to the back of the Jeep, he enlarged the platform so that his Tri-Wheeler would not fall off. The driver’s seat was removed and hand controls were installed. Braun did not know it yet, but this old Jeep eventually would lead to his next business. By 1970, Braun’s Jeep was headed for the junkyard, and he was in need of another vehicle. Previously, full-size vans had the engine located in the passenger compartment, which could not accommodate a wheelchair or scooter. Braun turned his attention to the new Dodge B-van, which was fresh off the assembly line. It was the first front-engine, full-size van on the market. Once the driver’s seat was removed, the van could easily accommodate a driver in a wheelchair or scooter. Braun’s major challenge was creating a lift for side entry. Rear entry was out of the question because he wanted seating for his growing family. While watching forklifts at work one day, Braun had his moment of insight. He envisioned using telescoping steel tubes and a hydraulic pump to construct a lift. Working nights and weekends on the lift over six weeks of trial and error, his lift was completed. 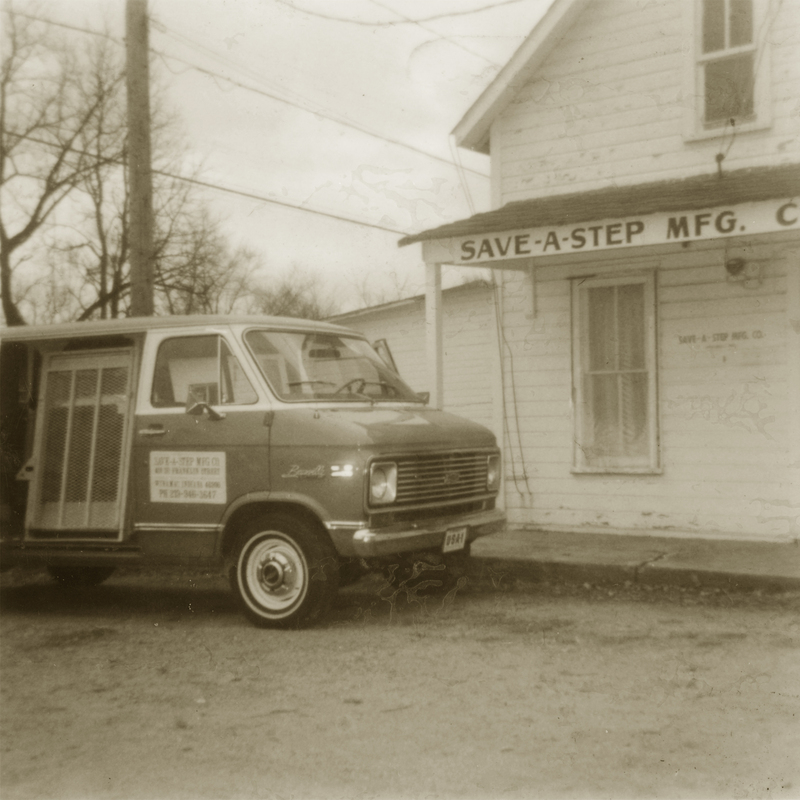 Braun's Save-a-Step Manufacturing Company and one of its lift-enabled vans. It took three weeks to construct the first version of the lift, and once Braun rode up and down several times, he knew that it needed revision. After three more weeks of refinement, it was complete. Now with the lift and the driver’s seat removed, the van almost accommodated his scooter, but a portion of the wheel well was in the way. Braun asked his brother-in-law to hammer it out with a sledgehammer, and he rolled right into place. Braun published an article about his van in Accent on Living and soon people began calling and showing up requesting wheelchair lifts and modifications to their vans. With help from family and friends, Braun worked nights and weekends in his father’s garage outfitting vans with custom-made lifts and other modifications to accommodate drivers and passengers in wheelchairs. It quickly became obvious to Braun that he had found his second business. In 1972, he founded the Braun Corporation. 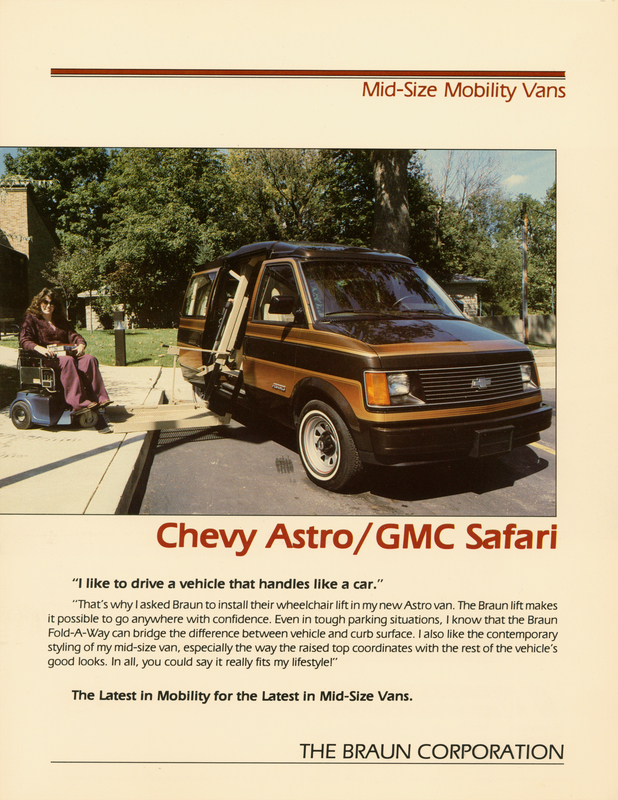 During the 1970s, Braun refined his wheelchair lifts, designing two models that would fit Dodge and Chevrolet vans, the Lifter and the Lift-a-Way. Depending on the customer’s needs, these lifts could provide side or rear entry for a wheelchair user. Inspired by ambulances, Braun also began making fiberglass roofs to provide the extra headroom needed for some wheelchair users. By the end of the decade, Braun’s business would outgrow his father’s garage and move into its own facility. The Braun Corporation would create its next major innovation after Chrysler introduced the Dodge Caravan and Plymouth Voyager minivans in the early 1980s. Braun’s team developed the process of lowering the floor of minivans and installing ramps rather than raising the roof and installing lifts as they had done with full-sized vans. Minivans were more appealing for several reasons; they were mainstream compared to full-sized vans, got better gas mileage, and were easier to park. 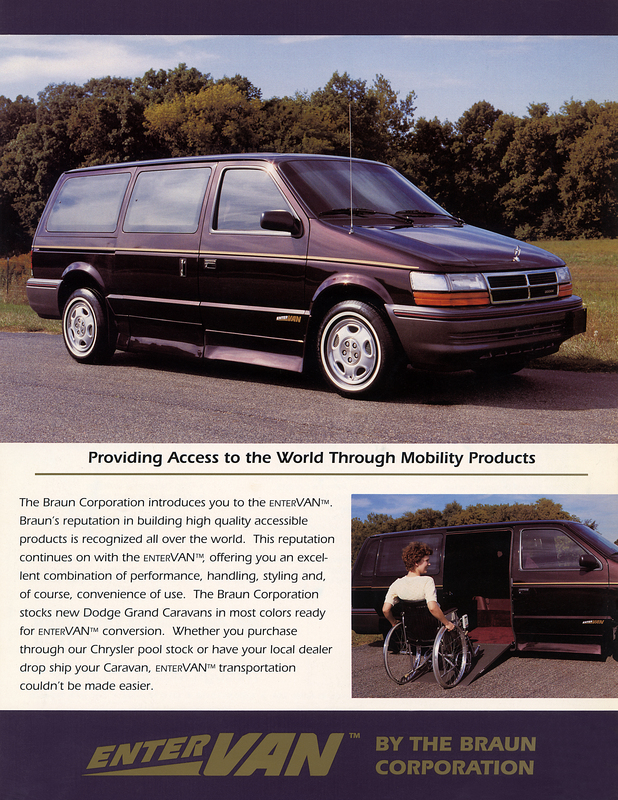 Braun’s wheelchair accessible minivans had the added appeal of rolling in with a ramp rather than riding a lift, and they looked like any other minivan on the road. 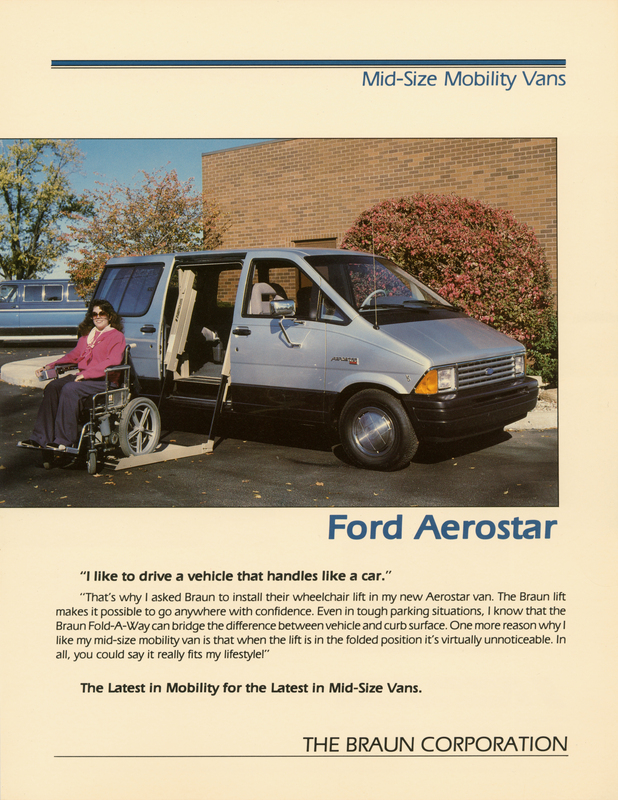 By the 1990s, the Braun Corporation had developed its flagship wheelchair accessible ramp enabled minivan, the Entervan, and soon shifted the company’s focus from full-sized vans to minivans. Three examples of Braun Corporation advertising for its conversions with full-size Ford, Chevrolet, and GMC vans as well as the Entervan conversion for minivans. Passage of the Americans with Disabilities Act of 1990 mandated access to any space where the public was allowed. This was a major triumph for the disability rights and independent living movements, which facilitated the widespread use of curb cuts, wheelchair ramps, elevators, wide doorways, and accessible bathrooms. This unprecedented adaptation to the built environment, combined with changing attitudes about the abilities of the disabled, caused a boom for the Braun Corporation and the mobility equipment industry. In 2007, the Braun Corporation rebranded under the name BraunAbility. Braun’s company, which started as a sole proprietorship in his parents’ kitchen and garage, became the world’s largest manufacturer of commercial wheelchair lifts and consumer wheelchair accessible, ramp-enabled minivans. Their products can be found on every continent. The company has stayed true to its roots, remaining privately owned and headquartered in Winamac, Indiana. Two organizations that are crucial for helping disabled individuals obtain accessible automobiles are ADED, the Association for Driver Rehabilitation Specialists, and NMEDA, the National Mobility Equipment Dealers Association. ADED was established in 1977 as the primary professional organization supporting driver educators and driving rehabilitation specialists who educate and train disabled drivers to use automotive adaptive technology. After evaluating a client’s abilities and needs, driver rehab specialists prescribe control modifications such as hand controls or left foot gas pedals and train drivers to safely operate them. ADED sets professional standards and best practices for the field and certifies its professionals. The organization also works with mobility equipment designers to develop new technology. NMEDA was founded in 1989 by a group of mobility equipment dealers to expand access for disabled individuals to safely drive or ride in specially adapted vehicles. Member dealers like BraunAbility and Drive-Master work with each other and ADED to advance vehicular adaptive technology and provide improved accessible transit options.